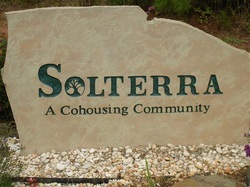 The name Solterra captures the relationship between sun and earth that characterizes the physical plan of our community. In a broader sense, it captures our interdependence as individuals and families both within a larger community and within the natural world. We reflect this interconnectedness by creating a community that integrates and harmonizes our lives with the natural world that surrounds us. We seek to create a place where diverse individuals can develop their uniqueness in a community of caring and trust. We believe in the importance of living in harmony with the natural world around us, that people have a natural desire to live in community, and that the purpose of community is to nurture the individual, create a place for self-expression and development, and to welcome diversity. What matters most to us is prudence within the natural world, nurturance of self-expression and individual difference, and shared relationships that are inclusive, joyful and equal. Therefore, our community of diverse individuals and families focuses on integrating and harmonizing daily activities with those of the larger community and the natural world in the following ways. We reduce energy use through efficient design that takes advantage of the power of the sun. We are prudent in our use of toxic materials. We commit ourselves to recycling and reusing materials.